(CNN) - Gov. Chris Christie is getting some compliments about his shrinking waist line. 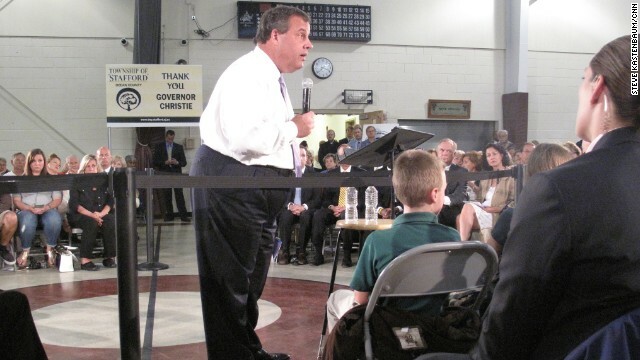 After filing a complaint with Christie at a town hall Wednesday in Ocean County, New Jersey, one woman told the Republican governor he looks a lot "smaller." "Let's not be totally unfair, I am much smaller now than I used to be," he said. "I used to be bigger." A little over a year ago, Christie revealed that he underwent lap-band surgery a few months prior, in February 2013. The governor, who's thinking about running for president, said Wednesday that his wife tells him he needs to buy new suits. "But I'm on a budget," he added. "I gotta be careful, you know?" Not long after that, another woman prefaced her question to the governor with some more affirmation. "By the way, you do look fantastic," she said. "God bless you," he said in return, as the audience applauded. "I love coming to Ocean County." Christie's weight: Does it matter? In February, he received a similar compliment at a town hall. "Rome wasn't unbuilt in a day," he responded. While he may be losing weight, he still gets ribbed from time to time about his size. Comedian Joel McHale made multiple jokes about the governor at the White House Correspondents Dinner. CNN's Ashley Killough and Steve Kastenbaum contributed to this report. Smaller won't get this RINO any votes. Put a fork in him, he's done. While I do not want to diminish his healthy accomplishment, why would we want to vote for a guy that decides to take the easy way out (bariatric surgery) rather than work hard and be focused and disciplined? I do not like Gov. Christie. I do not support his policies, I do not support his management style, and I do not support his actions. But I do support his efforts to get into better health. Smaller so he blocks off less traffic maybe? Everything shrunk including his image. Can't wait for nice Catholic boy to be President of USA. The headline made me think Christie was talking about his brain, not his waist. Indeed, a small small man.